Cupcakes for Ashleigh’s Speedy Recovery! Wendy asked me to do cupcakes for her daughter, Ashleigh, who is recovering from an operation she had a few weeks ago. 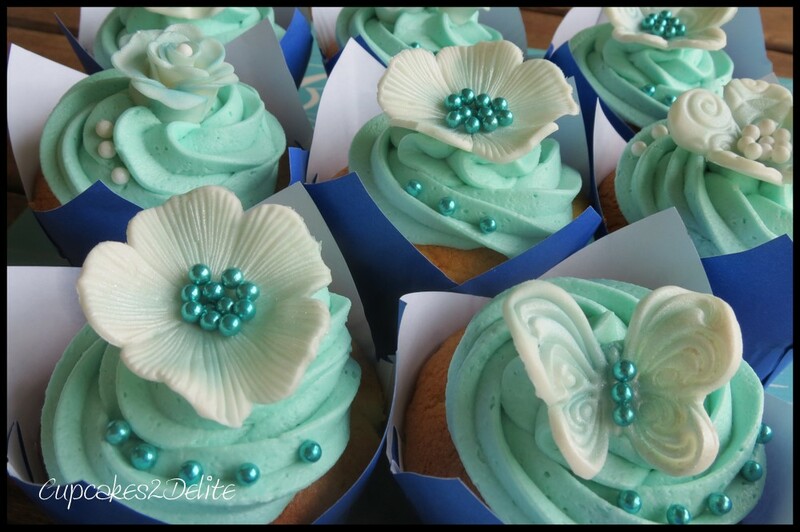 She said that Ashleigh loves the colour turqoise and also loves butterflies so I made vanilla cupcakes with a light turquoise icing and bright turquoise sugar pearls. I made all the flowers, roses and butterflies in white sugarpaste which I then dusted with my Rolkem powders. I veined some of the larger flowers with my FMM Flower Veiner and then dusted from the centre of each flower first with Rolkem’s Rainbow Spectrum Peacock and then with the Rolkem Sparkles in Aquamarine for a hint of shine. For a strong contrast I added the turquoise bright pearls as the centres to the flowers and butterflies. My inspiration for these cupcakes came from the excitement Wendy showed in ordering these cupcakes for her gorgeous daughter. Wendy is so proud of her daughter and the way she is recovering. Of course colour always inspires me, making this a perfect week to blog these cupcakes with it being Holi 2013, the Indian Festival of Colour. 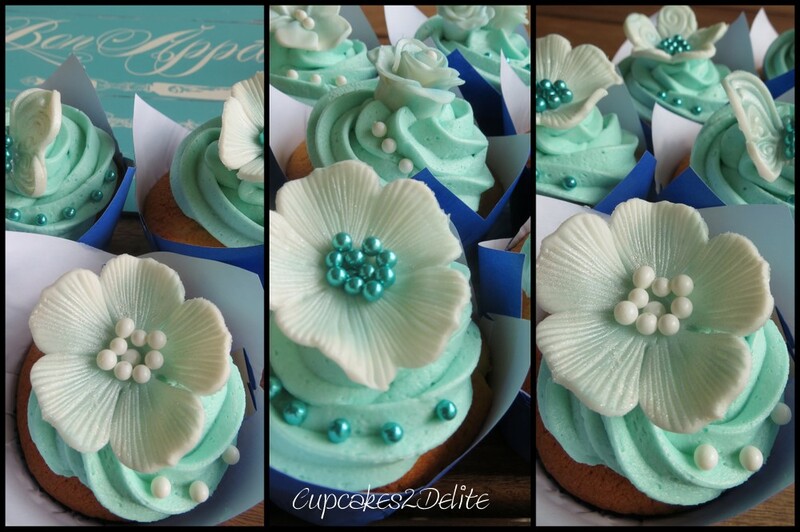 Ashleigh’s love for the colour turquoise and having recently caught up with Andries and Rolkem’s beautiful range of colours for sugarpaste work at the National Sugarcraft Show made it easy to create these pretty cupcakes for Ashleigh. Wishing you all the best Ash for a speedy recovery! What tools did you use to cut out and make the large petal flowers? I’ve never seen that type of flower cutter before and would like to make some that are similar. Thank you!